This page provides general information on how to use Greenlivingpedia. If you have a technical question which is not answered here, you may wish to check the help pages on Wikipedia (as Greenlivingpedia and Wikipedia use the same software); or please ask at the Technical questions page - we'll be glad to help! You can browse and search all Greenlivingpedia pages using the navigation links in the side bar, the categories and links between articles. You don't need an account for this. Use the Create article input box on the front page. Perform a search for the new title with the Go button in the sidebar on the left of the screen. When the search finds nothing, click on the red link "create this page". While editing an existing page, create an "interwiki" link to the new page by typing [[new page name]], then save the page. Then click on the redlink 'new page name' to edit the new page, add your content, then save it to create the page. Page names are case-sensitive, except for the first letter, which is automatically made upper-case. Don't capitalize all words, except for proper names, e.g. use Sustainable building rather than Sustainable Building. For guidelines on naming projects and other types of pages, see Help:Page naming. An edit box will open where you can make your changes. Edit the text in this box using Wiki markup language to format it. 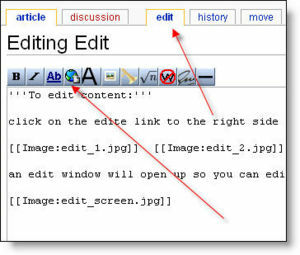 The buttons at the top of the edit box provide quick links for applying styles such as italic and bold, and markup for Interwiki and external links and image tags. You can preview your changes by clicking on the Show preview button. Then click on the Save button to save your changes and finish editing. Use the Save button to save your changes and finish editing. See Wikipedia:Help:Contents/Editing Wikipedia and * metawikipedia:Help:Editing for more information. Note that normal line breaks are ignored. To start a new paragraph, leave an empty line. You can also start a newline with the HTML tag <br>. Greenlivingpedia encourages the use of supporting media and images. Following are some instructions and guidelines on including media in your page. Before uploading, please ensure that you have rights to upload and redistribute the file(s) in question and that you in turn grant these rights to others. Save a file on your computer and remember where, i.e. what folder. 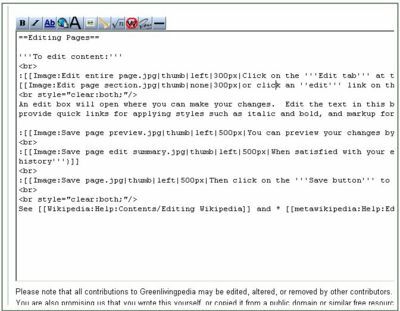 On the Greenlivingpedia sidebar click "Upload file"
This link is located in the menu on the left in the "toolbox"
This will fill the Source and Destination Name of that file into the corresponding text fields. Then press the "Upload file" button to finish the upload. This may take some time if you have a slow internet connection. The preferred formats are JPEG for photographic images, PNG for drawings and other iconic images, and OGG for sounds. Please name your files descriptively to avoid confusion. Please note that as with wiki pages, others may edit your uploads (and admins may delete them) if they think it serves the project, and you may be blocked from uploading if you abuse the system. Once your file is uploaded you will probably want to put it in your page. Huge image files should be avoided - it puts a load on the servers and makes pages load slowly (especially in remote or underdeveloped areas). Usually the file should be compressed to 100 kB or less (200 kB or less for a very large or detailed picture). Raw photos from digital cameras can be more than 1 MB, which is much too large. An image editing tool can help you make it smaller. An excellent free program for Windows users is Easy Thumbnails. By default it makes small "thumbnail" images, but the output can be adjusted to any size, and a preview is given (with the output file's size in the top bar). This program seems to give optimal quality for a relatively small image size. See Wikipedia:Picture_tutorial for more options.